Bake potatoes and let cool, cut potatoes in half length-wise. Using a spoon, scoop centers out of potatoes and place into a separate bowl and mash coarsely. In a sauce pan, brown ground beef and drain of grease, add all ingredients and spices to hamburger, mix well. spoon mixture back into hollowed out potato shells and place on baking sheet. Top with shredded cheese and bake for 15 minutes at 375 degrees. serve hot. Yes, you do add the potatoes are added back in. 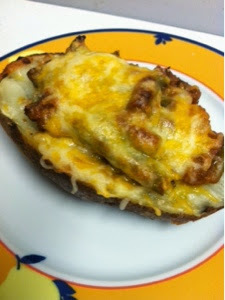 What a great idea for that baked potato, this looks wonderful! Thanks so much for sharing this awesome recipe with Full Plate Thursday. Hope you are having a great weekend and come back to see us real soon!